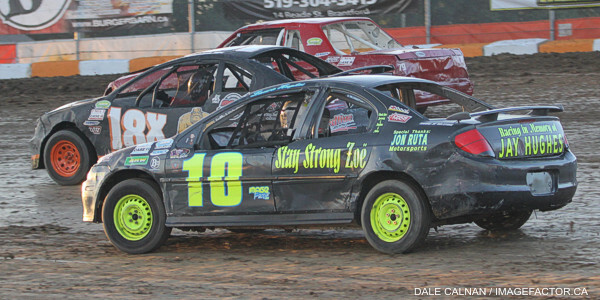 by Tommy Goudge (August 9, 2013) – 102 drivers signed in to race on Rochester Knighthawks “Art Hill Memorial” night at Ohsweken Speedway on Friday night. Jim Huppunen, Lee Winger, Wyatt Van Wart, Mike Taylor, and Dusty DeBoer took the feature wins..
Shane Ross and Mikey Kruchka made up the front row for the Sprint Car feature, and Kruchka took off in search of his 2nd career feature win. His lead was erased when Jeremy Hughes spun in turn 2 to bring out the yellow flag, and again when Glenn Styres’ engine went up in flames in turn 3. Jamie Collard eventually got by Kruchka, but Jim Huppunen charged back through the pack after falling to as far as 6th place. Huppunen got around Kruchka with 3 laps to go, and set his sights on Collard. Huppunen made a move between Collard and slower car in turns 3 and 4 on the last lap to take his first win of the season, and extend his lead in the points standings. Collard settled for the runner-up spot, followed by Mikey Kruchka, Mitch Brown, and Chris Steele. Heat races for the 19 car field were claimed by Mitch Brown, Derek Jonathan, and Jim Huppunen, while Jamie Collard won the Nathan Ackland State Farm Insurance “Top Gun” award for scoring the most heat race passing points. 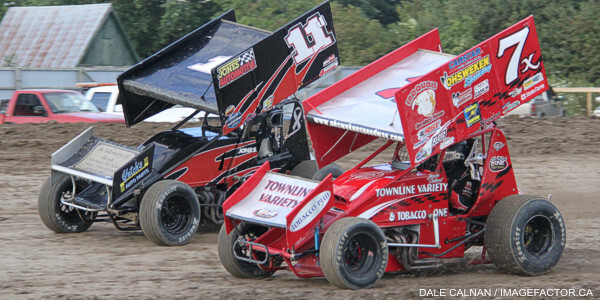 The Thunder Stocks had some extra racing on their schedule on Friday night, as their postponed B-Main and A-Feature from July 19 were run before the week’s regularly scheduled racing. Rob Disher and Brett Rodwell made up the front row for the first feature, but Cory Turner quickly made his way to the lead from row 4. Turner led until the final lap, when he and Jack Myers made contact, and Lee Winger got around them to take the win. Jake Brown, Jack Myers, Chris Dickie, and Brad Herron finished out the top 5, while Cory Turner crossed 6th. The second feature began with Melissa Miller and Robbie General on the front row, but Wyatt Van Wart quickly made his way through the field from row 6 to take the lead by lap 3. Van Wart led the rest of the way, while Lee Winger, Bryce Richardson, Jim Lampman, and Brad Herron chased Van Wart across the finish line. Heat races for the 33 car field were claimed by Ryan Beagle, Bryce Richardson, Ryan Dinning, and Karl Sault, while Mike Thorne won the B-Main. The longest feature of the Mini Stock season began with Brittani Myers and Brandon Janssens sharing the front row. Chase Hess and Jason Lungaro made their way to the front and broke away from the pack for awhile, but Mike Taylor eventually ran them down. Lungaro was leading, but had trouble getting through traffic, which allowed Taylor to make a move to the inside. Lungaro made contact with a slower car and was penalized for rough driving, while a promising night ended for Hess at the same time with an electrical fire on his car. Taylor kept the Dave Bailey-owned #31 up front for the rest of the grueling race, while Rocco Conte came from the B-Main to take the runner-up spot, followed by Mark Czuba, Dan Erskine, and Jonathan Ayrton. Heat races for the 36 car field were claimed by Brandon Janssens, Chase Hess, Alex Schuts, and Jason Lungaro, while Steve Miller won the B-Main. Clinton Nicholls and Bobby Burgess were scheduled to be on the front row for the Bomber feature, but Burgess stepped out of his ride to allow Dusty DeBoer to start the race after DeBoer’s car broke in his heat race. That move proved crucial, as Jesse McDonald crossed the finish line first, but did not pass technical inspection. 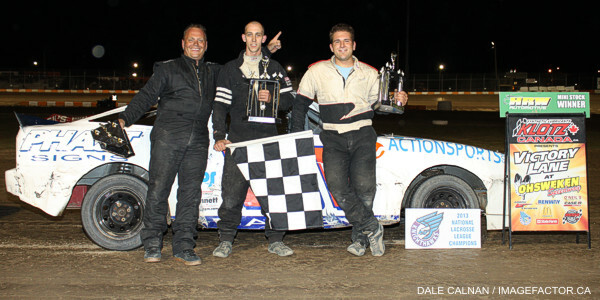 Dusty DeBoer charged through the field to cross the line behind McDonald, and was awarded the feature win when McDonald was disqualified. Brady Longboat, Max Chechalk, Mark Bazuin, and Adam Hallett rounded out the top 5. Heat races for the 14 car field were claimed by Brady Longboat and Jesse McDonald. Metals Works presents another round of weekly Friday night racing at Ohsweken next Friday, August 16, featuring the Corr/Pak Merchandising Sprints versus the Southern Ontario Sprints tour, plus Affordable Towing & Recovery Thunder Stocks, HRW Automotive Mini Stocks, and Gale’s Auto Aftermarket Bombers. Spectator gates open at 6:00pm, with racing starting at 7:30pm! 1. 10 Mitch Brown (Brantford), 2. 7x Jamie Collard (Burford), 3. 3r Shane Ross (Thedford), 4. 0 Glenn Styres (Ohsweken), 5. 5 Keith Dempster (Alton), 6. 07x Dain Naida (Tecumseh, MI), DNF. 5c Conor Mahoney (Waterdown). Time – 1:56.639. 1. 81 Derek Jonathan (Lewiston, NY), 2. 80 Chris Steele (Fenwick), 3. 11 Jamie Turner (Caistor Centre), 4. 49 Todd Hoddick (Cheektowaga, NY), 5. 30g Steve Goldner (Aylmer), 6. 10j Jeremy Hughes (Burlington). Time – 2:00.588. 1. 14h Jim Huppunen (Fenwick), 2. 27h Tom Huppunen (Fenwick), 3. 01 Mikey Kruchka (Hamilton), 4. 9nz Havard Daniels (Coatesville, NZ), 5. 31 John Burbridge, Jr. (St. Williams), 6. 43 Scott Sherk (Port Colborne). No Time. 1. 04 Wyatt Van Wart, 2. 84rk Ryan Beagle, 3. 4 Dale Gyokery, 4. 119 Shaun Quinn, 5. 85h Brad Bacher, 6. 11r Bryce Richardson, 7. 57 Murray Nicholls, 8. 00 Robbie General, 9. 911 Nick Liverance, 10. 93 Melissa Miller, DNF. 29 Jim Gracey, DNF. 44 Kevin Dawson, DNS. 003 Derek Miller, DNS. 3b Blaine Barrow. Time – 4:13.157. 1. 84rk Ryan Beagle (Vittoria), 2. 44 Kevin Dawson (Caledonia), 3. 17 Rob Disher (Grimsby), 4. 00 Robbie General (Ohsweken), 5. 93 Melissa Miller (Ohsweken), 6. 4 Dale Gyokery (Jarvis),DNS. 68 Aaron Turkey (Ohsweken), DNS. 119 Shaun Quinn (Caledonia), DQ. 9 Dave Silverthorn, Jr. (London). Time – 2:48.665. 1. 11r Bryce Richardson (Port Colborne), 2. 12 Brad Herron (Waterford), 3. 777x Steve Hess (Ohsweken), 4. 38 Terry Martin (Ohsweken), 5. 77 Brett Rodwell (Caledonia), 6. 73 Mike Miller (Caledonia), 7. 911 Nick Liverance (Brantford), DNF. 55 Mike Thorne (Caledonia). Time – 2:49.049. 1. 85b Ryan Dinning (Caledonia), 2. 28 Jim Lampman (Caistor Centre), 3. 04 Wyatt Van Wart (Cambridge), 4. 19 Cory Turner (Caistor Centre), 5. 23 Trevor DeBoer (Caledonia), 6. 31 Dave Bailey (Hagersville), 7. 29 Jim Gracey (Dunnville), 8. 57 Murray Nicholls (Hamilton). Time – 2:45.953. 1. 81 Karl Sault (Dundas), 2. 2 Lee Winger (Caledonia), 3. 1 Chris Dickie (Brantford), 4. 33 Jack Myers (Wainfleet), 5. 10 Jake Brown (Brantford), 6. 91 Ryan Turner (Caistor Centre), DNS. 25 Billy Bleich, Jr. (Port Robinson), DNS. 85h Brad Bacher (Hagersville). Time – 2:42.892. 1. 55 Mike Thorne, 2. 31 Dave Bailey, 3. 73 Mike Miller, 4. 25 Billy Bleich, Jr., 5. 91 Ryan Turner, 6. 4 Dale Gyokery, 7. 29 Jim Gracey, 8. 57 Murray Nicholls, 9. 911 Nick Liverance, DNS. 68 Aaron Turkey, DNS. 119 Shaun Quinn, DNS. 85h Brad Bacher, DQ. 9 Dave Silverthorn, Jr. Time – 4:06.314. 1. 66 Brandon Janssens (Woodstock), 2. 69 Rob Twitchett (Dundas), 3. 1 Kathi Dickie (Brantford), 4. 69e Dan Erskine (Caistor Centre), 5. 22 Brittani Myers (Hamilton), 6. 76 Jamie Goudge (London), 7. 84 Jade Pelletier (Wainfleet), 8. 12 Chantelle Hyatt (Millgrove), DNF. 11 Mike Giberson (Caledonia). 1. 7x Chase Hess (Ohsweken), 2. 21 Jonathan Ayrton (Hamilton), 3. 55 Rob Slater (Dundas), 4. 05 Dave Goodacre (Brantford), 5. 90 Chad Smelser (Dunnville), DNF. 16 Jeremy May (Hamilton), DNF. 96t Mike Taylor (Hamilton), DNF. 79 Steve Miller (Paris), DNF. 64 Doug Erskine (Hamilton). 1. 81 Alex Schuts (Oakland), 2. 02 Mark Czuba (Burlington), 3. 47x Kyle Pelrine (Beamsville), 4. 18x Davey Boughton (Carlisle), 5. 1c Evan Curtis (Wainfleet), 6. 8 Barry Westman (), 7. 34 Rocco Conte (Welland), 8. 29 Lucas Lubin (Hamilton), DNF. 5 Rick Robinson (Brantford). 1. 7 Jason Lungaro (Hamilton), 2. 38r Rodney Rutherford (Waterdown), 3. 10 Laura Hughes (Puslinch), 4. 31 Mike Taylor (Burlington), 5. 38 John Cote (Hamilton), 6. 4 Jason Coutu (St. Catharines), 7. 66x Jon Janssens (Woodstock), 8. 53 Mark Verhuel (), DNF. 71m Leroy Buscumb (Port Colborne). 1. 79 Steve Miller, 2. 34 Rocco Conte, 3. 53 Mark Verhuel, 4. 71m Leroy Buscumb, 5. 29 Lucas Lubin, 6. 76 Jamie Goudge, 7. 84 Jade Pelletier, 8. 12 Chantelle Hyatt, 9. 8 Barry Westman, 10. 96t Mike Taylor, 11. 66x Jon Janssens, 12. 11 Mike Giberson, DNS. 16 Jeremy May, DNS. 64 Doug Erskine, DNS. 5 Rick Robinson, DNS. 4 Jason Coutu. 1. 66 Brady Longboat (Ohsweken), 2. 43c Clinton Nicholls (Hamilton), 3. 6 Wayde Thorne (Waterford), 4. 97 Max Chechalk (Hamilton), 5. 32 Gillian Hils (Dundas), 6. 03d Dakota Potts (Waterford), DNF. 23 Dusty DeBoer (Hagersville). 1. 88 Jesse McDonald (Caledonia), 2. 9 Tim DeBoer (Caledonia), 3. 188 Paul Longboat (Ohsweken), 4. 21 Mark Bazuin (Caledonia), 5. 18 Adam Hallett (Cambridge), 6. 28 Bobby Burgess (), 7. 7L Valen Longboat (Ohsweken).